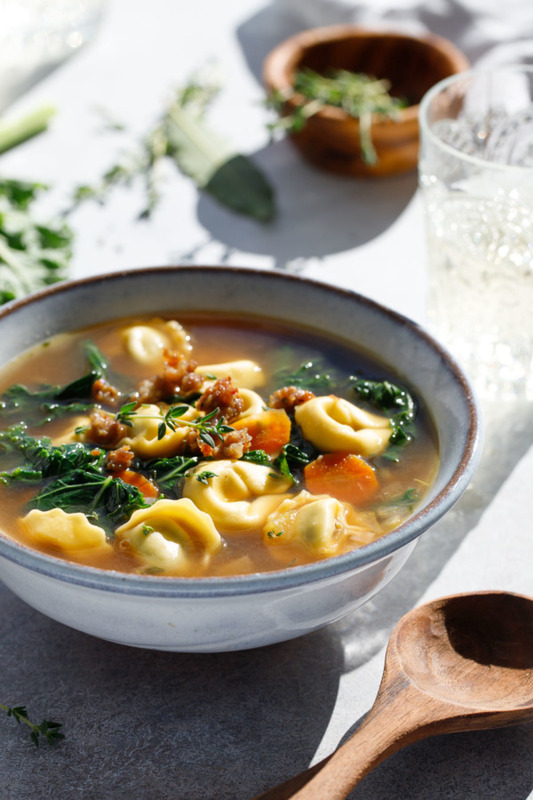 Bite sized spinach tortellini, leafy green kale, and flavorful Italian sausage play a starring role in this satisfying winter soup that’s packed full with flavor. 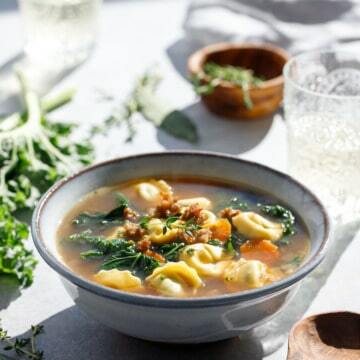 Our new favorite soup recipe, this tortellini soup is a cinch to whip up and is filled with hearty, flavorful ingredients. It’s easily twice as flavorful as boring old chicken soup, but just as comforting… I have a suspicion it’ll become your new favorite soup recipe, too. Another sunny soup to brighten up a winter’s day. ‘Tis soup season, after all. We threw together the first iteration of this recipe a few weeks ago as a sort of clean out the fridge kind of dinner. 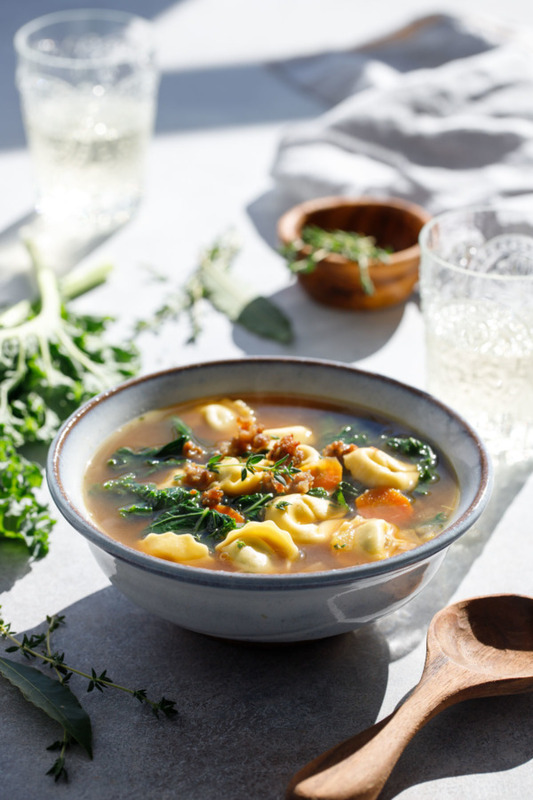 We dug out a sad bunch of kale that was on its last legs, and when your kale is less than fresh (not exactly something you want to turn into a salad anymore), soup is the perfect solution. 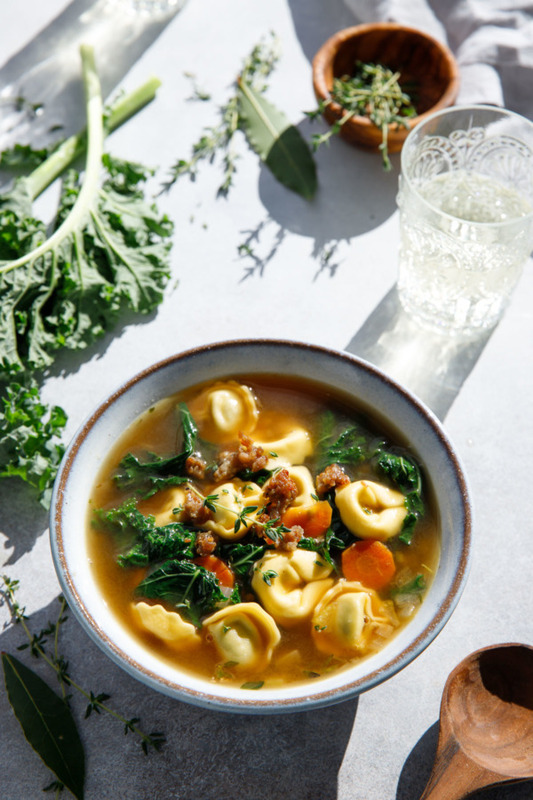 So we cooked the kale in a flavorful brothy soup filled with fragrant vegetables and pockets of cheese-filled pasta, and even without the sausage, we could tell this soup had major potential. The second time around we tweaked the proportions (less kale, more broth) and added the Italian sausage. Just 1/2 pound is enough to add a robust, meaty richness that rounds out this recipe perfectly. The hint of fennel and other Italian herbs are a lovely touch, too. We used a bulk Italian sausage, sold by the pound so you can get just what you need without any waste. But if you can’t find bulk sausage, raw Italian sausage links will work too, just remove the casings and treat it just like you would ground meat. My preference here is for refrigerated tortellini, their small size making them perfect for soup. Add them right to the simmering broth at the very end and they’ll be done in a matter of minutes. If you can’t find fresh, frozen tortellini would be your next best bet (adjust the cook time accordingly since frozen pasta will take a few minutes more). Dried tortellini is just plain weird, in my opinion, although better than nothing if that’s all you can find. We used a spinach tortellini here, but plain cheese or even a nice sausage tortellini would work just as well here too. 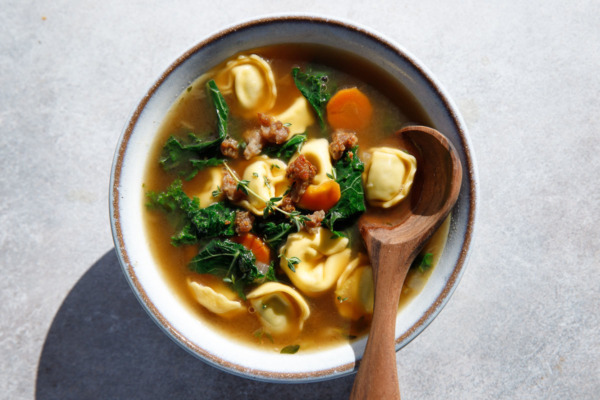 This soup makes great leftovers, although to avoid overcooked pasta I’d recommend just cooking the amount of tortellini you plan to eat immediately. Then, the next day or whenever you want to eat the rest, bring the leftover broth to a simmer and cook the remaining tortellini at that point. Otherwise, the tortellini tends to get a bit soggy if it sits in the soup overnight. Still perfectly edible and delicious, but missing that al-dente bite that is so sought after with pasta. 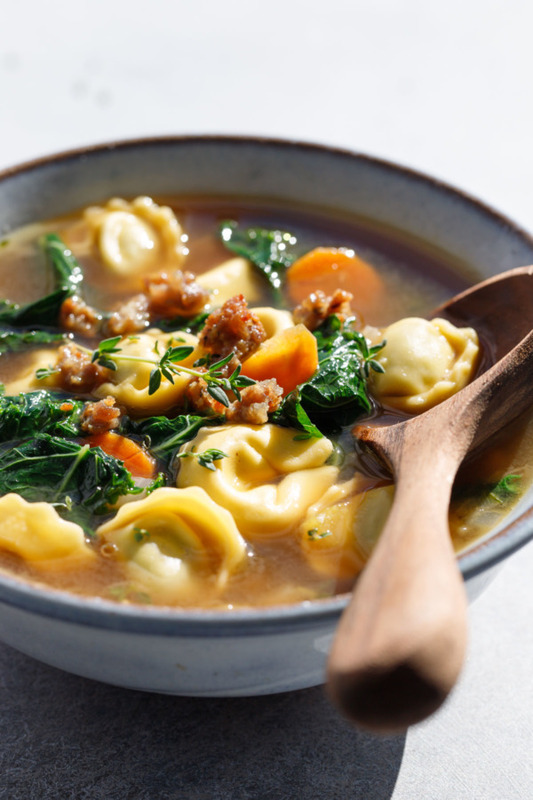 Spinach tortellini, leafy green kale, and flavorful Italian sausage come together for an easy and satisfying soup recipe that’s packed full with flavor. Heat olive oil in a large, heavy saucepan or dutch oven over medium-high heat. Add sausage, breaking apart with a wooden spoon as it cooks, until browned, 10 to 12 minutes. Remove sausage with a slotted spoon and place in a bowl; set aside. Return saucepan to medium heat and add carrot, onion and celery; season with salt and pepper. Sauté, stirring occasionally, until vegetables are softened and beginning to brown, about 5 to 7 minutes. Add garlic, thyme and bay leaf and sauté until fragrant, 1 to 2 minutes more. Add chicken broth and bring to a simmer; let boil gently for 5 minutes. 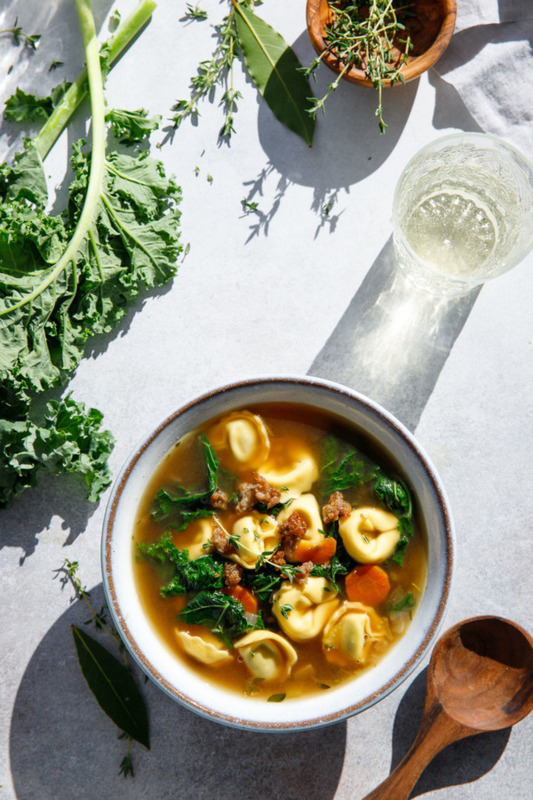 Add kale, cooked sausage and tortellini and simmer until tortellini is just cooked through (refer to package directions as exact cook time for your particular tortellini may vary, ours took 2 to 3 minutes; frozen may take longer). 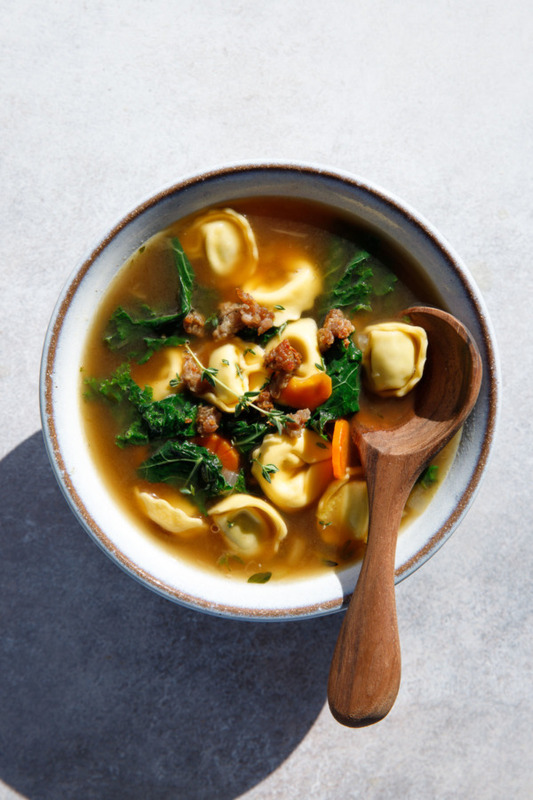 If you don’t plan to eat the whole batch of soup at once, you can also choose to just cook half the tortellini, then cook the rest when you re-heat the soup, that way the pasta doesn’t get soggy. Season to taste with additional salt and pepper as needed (if you used salted chicken broth you probably don’t need any more). Spoon into bowls and serve warm.